Figure 3-31. - Hand position for flossing maxillary posterior teeth. 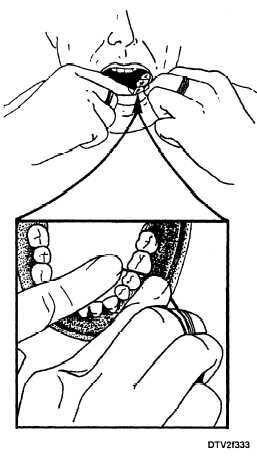 To clean between all lower teeth, hold the floss with the forefingers of both hands (fig. 3-32). You can insert the floss gently between all lower teeth with the floss over your forefingers in this position. Figure 3-33 illustrates the correct method for flossing between the lower back teeth, using the two forefingers to guide the floss. Figure 3-32. 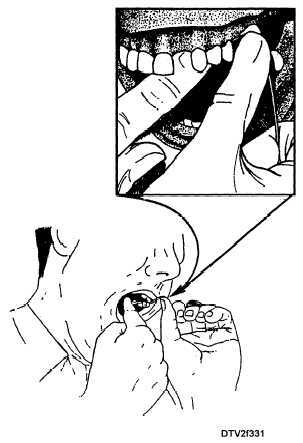 - Floss position for the mandibular teeth. Figure 3-33. - Hand position for flossing mandibular posterior teeth. material in the plaque. To ensure all areas of the teeth are clean, a disclosing agent can be used to determine if any surfaces on the teeth were missed during flossing. After treatment of the teeth or gums, the exposed root surfaces may be sensitive to cold and heat. This condition is usually temporary if the teeth are kept clean. If the teeth are not kept clean, the sensitivity may remain and become more severe. For the few patients who have severe sensitivity, the use of specially medicated toothpastes and mouthwashes may be recommended.